Black or lined up to 36" diameter according to ASTM, ASME, API, UNI, DIN, ANSI standards. according to ASTM or other international standards. Carbon steel, alloy steel, austenitic steel, ferritic-austenitic steel, titanium, copper, copper alloys, monel , inconel, hastelloy, incoloy. 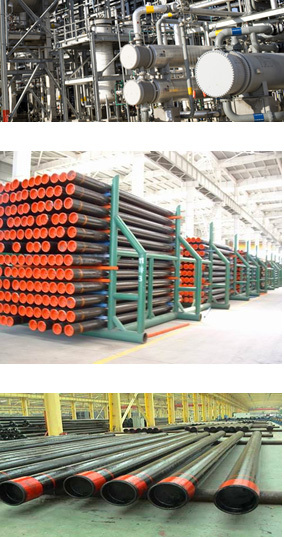 ASTM A106, A120, A178, A179, A200, A209, A210, A211, A213, A249, A269, A312, A333, A335, A358, A403, A409, A511, A789, A790, B68, B280, B163, B167, B337, B338, B407, B423. Gr.B, Gr.3, Gr.6, P1, P2, P5, P11, P22, Tp 304, Tp 304L, Tp 316, Tp 316L, Tp 321, UNS S31803, UNS S31550, UNS S32750, UNS S32760, UNS S31254, UNS C70600, UNS C70500, UNS N06600, UNS N08800, UNS N08825, UNS N08925, UNS C12200. API SPEC. 5L Gr.B, X42, X52, X60, X65. Dimensions acc. to ANSI B36.10, B36.19, API 5L.